Every level beader loves this fast and easy technique for beading a tubular rope that is designed to be as supple as bead crochet. It is an original stitch based on peyote but with strategically placed "articulating beads". The lined drop-beads appear illuminated, especially among the black beads...like fireflies at midnight. 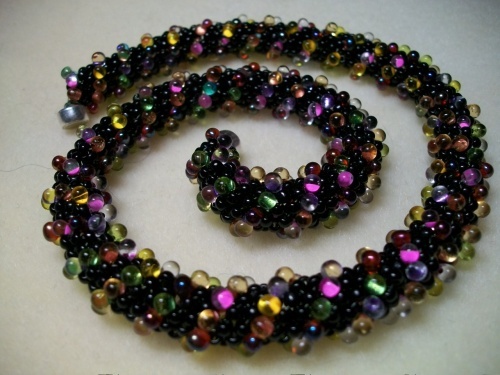 There are ample beads to make a much longer version or to make two to wear single, together or attached to each other. An extra magnetic closure is included to allow you this option. Size: Supply your own needle and thread.